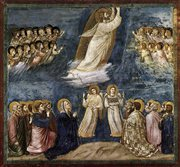 The paintings and artists’ rendering of the Ascension, found in our chapel and in many churches are wonderful. [L]et’s not be fooled . . . by the naïve literalism of certain paintings of the ascension, and for that matter certain hymns, which speak of Jesus going “to his home above the skies,” as though Jesus were some kind of primitive space-traveller. Heaven . . . is not a place thousands of miles up, or for that matter down, in our space, nor would it help us if it were. [Heaven] is God’s dimension of ordinary reality, the dimension which is normally hidden but which we penetrate mysteriously, or rather which penetrates us mysteriously, in prayer, in the scriptures, in the breaking of the bread. Just as it is ridiculous to build a beautiful house if nobody lives in it, and just as it is ridiculous and no use preparing this incredible, beautiful meal if nobody ever eats it, and just as it’s silly to build a . . . bomb to blast through a mountain [to] build a road . . . without a detonator, so the birth, the death and the resurrection of Jesus Christ are of no use without the ascension, for the ascension is the detonator for everything else Jesus Christ did. The Ascension is that which takes what Jesus Christ was and did on earth and releases it into the universe and into your lives with all of its healing power. The Ascension is the detonator. That’s why it matters. And let me flesh that out by showing how the Ascension matters because it’s about presence, power and purpose. First of all, presence – From Acts: “[A]s they were watching, he was lifted up, and a cloud took him out of their sight.” (Acts 1.9b) We’ve talked since Easter about how the strangeness Jesus’ post-resurrection body. Mary Magdalene thought he was the gardener; he could pass through locked doors; he could eat a fish, but it seemed he could vanish. But while Jesus’ resurrected body may have been mysterious, it was still a body, and a body can only be at one place at a time. An ascended Christ, though, isn’t bound by space and time; he’s everywhere, and nothing is outside his grasp. There was something fundamentally anomalous about their gazing up into the sky when they had been commissioned to go the ends of the earth. It was the earth not the sky which was to be their preoccupation. Their calling was to be witnesses not stargazers. The vision they were to cultivate was not upwards in nostalgia to the heaven which had received Jesus, but outwards in compassion to a lost world which needed him. The point of experiencing God is never just the experience itself; we don’t worship just for ourselves. Experiencing God changes us and makes God’s purpose our purpose. In short, we come away witnesses. The apostles saw the Ascension and went back into the world “like thunderbolts,” and so should we. We experience God in this place, we actually ascend to heaven at the Sursum Corda (we “lift our hearts up to the Lord”), we receive Jesus in bread and wine, and we’re driven back into the world like a shot to witness to what we’ve seen and to share in Jesus’ work. Jesus is still saving the world and renewing creation, and he still does it one person and one gracious act at a time. It’s just that now he sends us to do it for him. In fact, he sends us to do it as him. So when you give someone a cup of cold water, when you buy a hungry man a meal, when you stand shoulder-to-shoulder with someone who is oppressed, when you take some of a friend’s pain on your own shoulders, your hands are Christ’s hands; your feet are Christ’s feet carrying on his ministry in the world. We are the body of the ascended Christ, and the Holy Spirit gave us all gifts (charismata) to “flesh out” that body, to continue the incarnation of the redeeming God in our neighborhood, our workplaces, our city, our world. The Ascension detonated all Jesus did, made him present with us, gives us power and purpose.